� Copyright 2010 Apeiron Technical Products. All rights reserved. Please read Terms and Conditions. 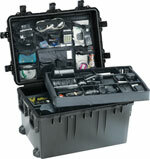 Apeiron Technical Products specializes in custom designed cases and containers for engineered systems and test equipment kits. 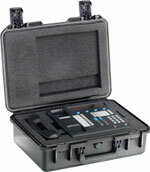 We are a Distributor for Pelican Products the producer of Pelican/Storm™ Cases and various Rotomolded product lines, the World leader in equipment protection. 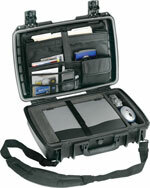 We also distribute parker Shipping cases. Portable communication, radar and other CPU or optical based devices devices suffer impacts in usage; LCDs cracking, wires or fibers disconnecting, etc. Our experience can help you find the right packaging for your desired " level of protection" to keep systems operational at a reasonable cost. Example: Laminating different density foams together can sometimes reduce costs and improve performance.